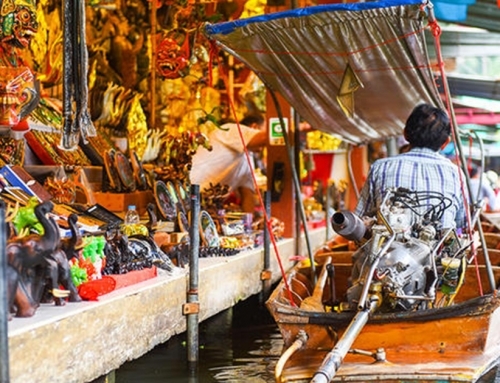 Superb street food isn’t hard to find in the Thai capital. 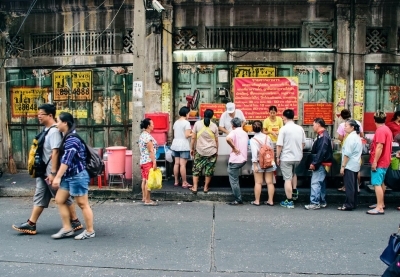 Indeed, Bangkok’s street food is something of a legend with international travelers. 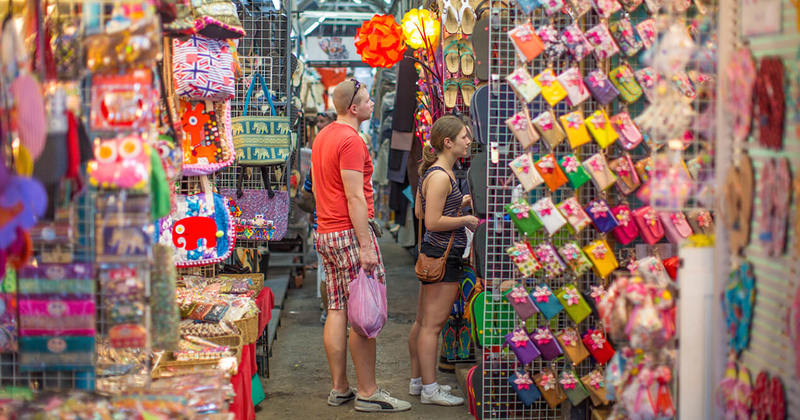 The many choices available to hungry passers-by can easily bewilder first-time tourists. Anyone interested in trying out Bangkok’s delicious cuisine for themselves must check out this list. 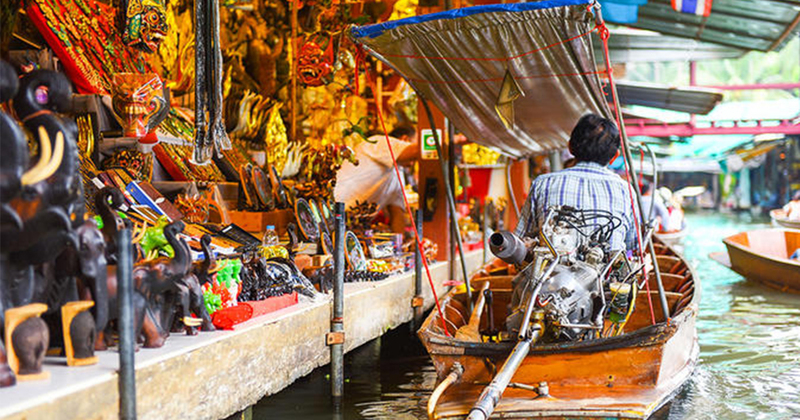 Below, we’ll go through ten of the best foods you have to try while strolling the streets of Bangkok. When people think of Thai cuisine, usually they think of lots of exotic spices and sauces. While it’s true that many traditional Thai dishes have these elements, one of the most popular recipes in Thailand is actually quite simple. Khao Mun Gai is simply chicken atop a bed of rice with a mild sauce. So, what do Thai people go crazy for Khao Mun Gai? Well, it all has to do with the preparation. The chickens used in Khao Mun Gai are juicy and plump, and the rice is smothered in delicious chicken broth. Perhaps the most crucial element of the chicken and rice dish, however, is the sauce. While there’s no standard garnish for Khao Man Gai, many vendors use a combination of ginger, red chilies, and soy sauce. On the side, customers usually get a fresh cucumber slices and cilantro as well as a bowl of chicken soup. 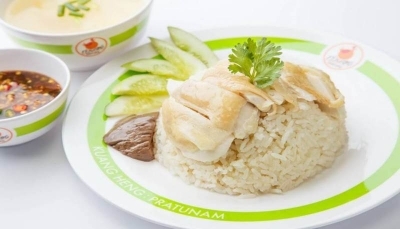 To get a good tasting Khao Mun Gai at a reasonable price, be sure to visit Kuang Heng Pratunam Chicken & Rice at 930 New Petchaburi Road. This highly decorated food stand is near the Platinum Fashion Mall just a short walk from the Chit Lom BTS stop. Usually translated as “Boat Noodles,” Kuay Teow Reua is a dish that dates back to the 1940s when chefs would give this hearty meal to seafaring folks. Besides the noodles, the main elements of this dish include large slices of pork, beef, and liver. These meats are all tossed together with a wide variety of herbs, spices, and sauces, including soy sauce, bean curds, garlic, and parsley. 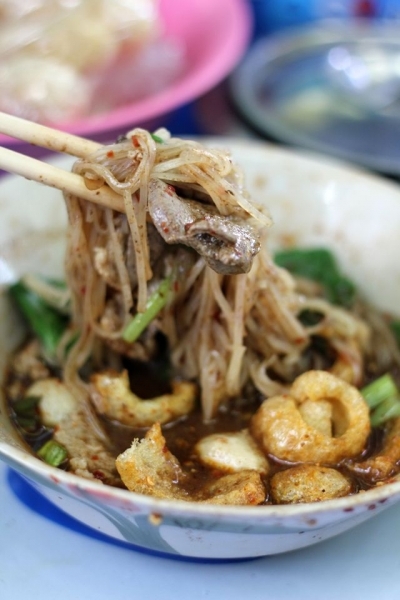 The area of Bangkok that boasts the best Boat Noodles is located around the famous Victory Monument. 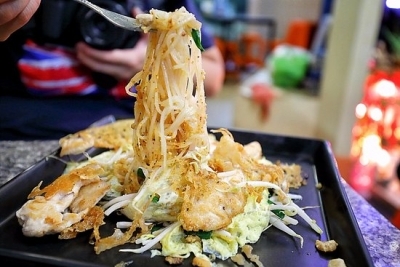 One restaurant that has gotten a ton of praise for its Boat Noodles is named Toy Kuay Teow Reua Boat Noodles at 15 Ratchawithi Road. Toy Kuay Teow Reua is only a short walk from the BTS Victory Monument stop. Although Hoi Tod is technically an omelet, most people who eat it for the first time describe it as a “flaky pancake” Besides eggs, the main ingredients in a traditional Hoi Tod include oysters, corn starch, a touch of cilantro, a few green onions, and chili. If you prefer, you could substitute oysters for mussels or squid. Usually, a Hoi Tod chef will mix all the ingredients listed above together and then pour it onto a hot grill. Once it has reached a golden color, the skilled chef pulls the Hoi Tod off the grill and serves it to his/her hungry customers with a side of chili sauce. Hoi-Tod Chaw-Lae Restaurant at Soi Sukhumvit 55 has a great reputation for its Hoi Tod. 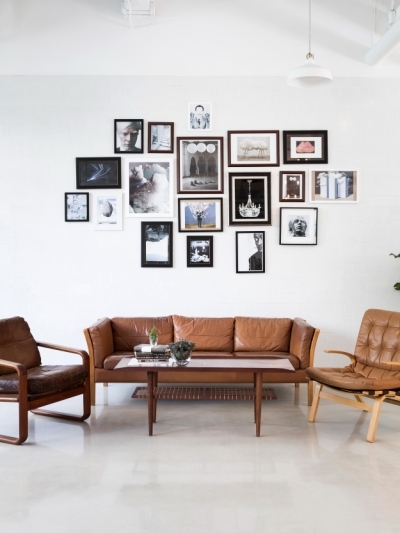 You can easily get to this restaurant by taking the BTS Sukhumvit Line to Thong Lo. People who crave spicy food won’t be disappointed with a bowl of Kuay Jub. This spicy soup, which probably had its origins in Chinese cuisine, gets its kick from spoonfuls of white pepper. In addition to the pepper, Kuay Jab always includes long rice noodles and pork belly. Sometimes chefs dress this recipe up with common herbs and spices like cilantro, garlic, and even a touch of tofu. There are actually two versions of the broth used in Kuay Jab. The more classical Chinese version of the recipe is known as Kuay Jab Nam Kon and has more spices which makes it rather dark in color. 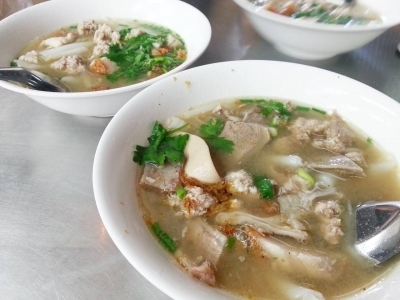 Kuay Jab Nam Sai, on the other hand, has a clear pork broth. 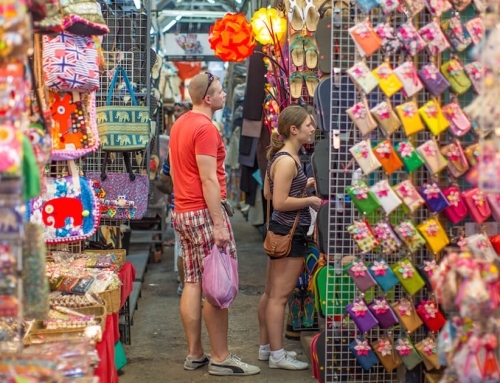 Obviously, the best place to get your hands on Kuay Jub is in Bangkok’s Chinatown district. One of the best restaurants you could find here is called Nai Ek at 442 Soi 9, Yaowarat Road. 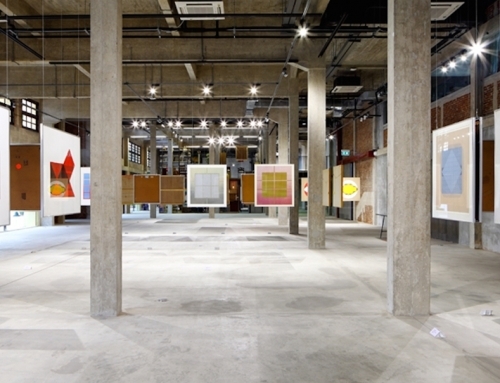 To get here from the Siam Center Tube Station, simply hop on a bus headed towards Chinatown. Pork satay skewer stands are amongst the most popular in Bangkok. There are numerous ways different satay vendors dress up their satay recipes, but the most common ingredients they use include coconut milk, peanut butter, lime, soy sauce, garlic, cilantro, turmeric, and chili. If pork isn’t your style, then you should have no issues finding chicken satay as well. 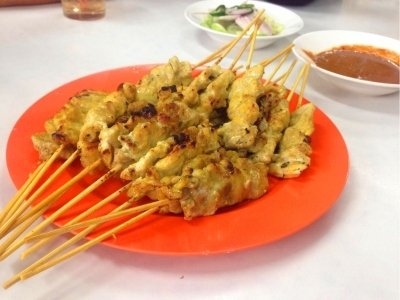 One of the most highly decorated satay stands is Chong Kee located near Chinatown. The pork skewers at this restaurant are so good that members of the Thai Royal Family are known to order food here. To taste Chong Kee’s regal recipes for yourself, take the BTS to Asok then grab an MRT_BLL bus to Hua Lamphong. Chong Kee is located close to the famous Phra Phuttha Maha Suwana Patimakon Temple. Although roti bread originated in India, it’s quite popular in Thai cuisine. Often Thai food vendors like to roll meats like chicken and pork into their roti with traditional spices and herbs. The thin nature of roti, which is unleavened bread after all, makes it perfect for people looking for a quick bite on the go. Roti Mataba has been in business for well over 70 years, and this restaurant shows no signs of stopping. Guests enjoy how the chefs at Roti Mataba are able to seamlessly blend Middle Eastern, Thai, and Malaysian cuisines into their roti dishes. Besides roti chicken and roti ham & cheese, Roti Mataba offers many savory dishes like beef soup and fish biryani. 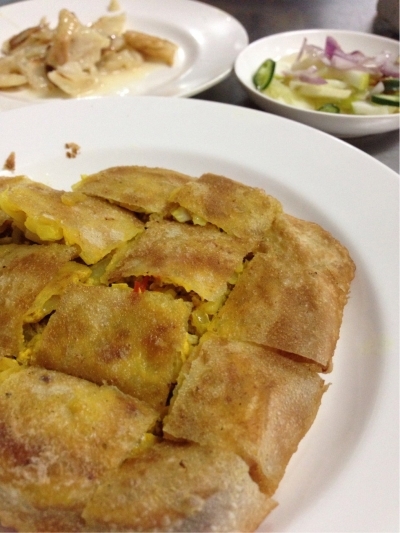 Located at 136 Thanon Phra Athit, Roti Mataba is a short bus ride away from the BTS Phaya Thai stop. Thai curry pastes tend to use locally grown chilies, seafood, lemongrass, onions, garlic, and cilantro. The variety of Thai curry dishes available in Bangkok is endless, but one of the defining features of these curries is the use of heavy coconut milk. Common curries you’ll find in Bangkok include red, yellow, phanaeng, and green. You can usually choose from a wide variety of meats, fish, and veggies to put into your curry. If you want a good introduction to the world of Thai curry, head on over to Khao Gaeng Jake Puey at 25 Charoen Krung Soi 19, Mangkon Road. Without a doubt, the most famous dish offered at Khao Gaeng Jake Puey is Kaeng Kari Moo, which is made with yellow coconut milk curry and slices of pork. This curry stand is only a short ride from the Hua Lamphong MRT stop. With a name like “stink bean,” you might not be so tempted to try this Thai delicacy. Although they smell a bit rancid, stink beans are extremely healthy and taste surprisingly savory. 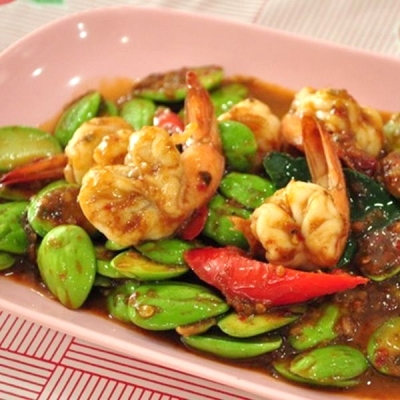 A good way to introduce your palate to these beans is to order the dish Goong Pad Sataw, which features sautéed stink beans, oyster sauce, curry paste, and shrimp. A great place to pick up a dish of Goong Pad Sataw is Ran Gaeng Pa Sriyan located at 954/2 next to Dusit Post Office, Nakhon Chaisri Road. This restaurant is close to the BTS stop Ratchathewi. Looking for something sweet to cap off your meal? 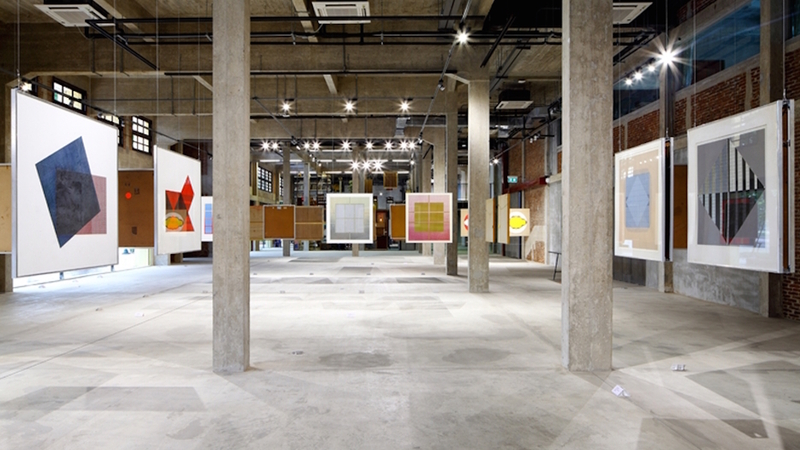 Then Khao Niew Mamuang is right up your alley. Khao Niew Mamuang is one of the most famous Thai desserts and is often translated as “mango sticky rice” in English. Like the name suggests, this recipe incorporates slices of mango around sticky rice laced with coconut milk and sugar. The restaurant Kor Panich at Prang Bhutorn is the most famous in Bangkok for its Khao Niew Mamuang. The dessert at Kor Panich is so good that it’s recommended by members of the Thai Royal Family. If you want to sample the classic version of this dessert, then you need to pop into Kor Panich at 431-3 Tanao Road. 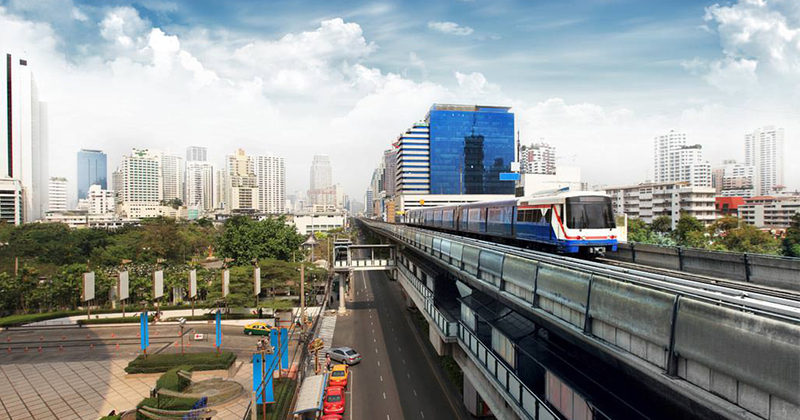 You can take a bus near the Phaya Thai BTS stop to get to Kor Panich. Last, but certainly not least, is perhaps Thailand’s most famous street food: Pad Thai. There are dozens of variations on this noodle dish, but all Pad Thai recipes include rice noodles, crushed peanuts on top, and lime wedges on the side. Pad Thai dishes also tend to use fish sauces, shrimp, tamarind paste, sugar, bean sprouts, and scrambled eggs. The Melting Pot restaurant at Beat Hotel serves up a classic Pad Thai to guests. The Melting Pot’s Pad Thai includes succulent shrimp, fried noodles, and an egg wrap. Anyone can try this exquisite meal (and many more) at the Beat Hotel, which is located at 5/4-5/5 Sukhumvit 71 Road, Phra Khanong-Nua, Wattana.